I'm proud to share that Applied Materials has once again been recognized today for its outstanding support of military veterans and National Guard and Reserve members, and has been designated a 2014 Military Friendly Employer by G.I. Jobs magazine. This marks the eighth consecutive year that the company has been included on the list, which was complied from a data-driven survey of more than 5,000 companies whose annual revenues exceeded $500 million. Applied has a robust military recruitment program that provides outreach and professional development opportunities for employees with military backgrounds and assists them with the transition from the military to a corporate culture. When military veterans join Applied they join a network of fellow veterans that can help them integrate into the corporate environment. Criteria for selection to GI Jobs' list included the strength of military recruiting efforts, the percentage of new hires with prior military servce, retention programs, and company policies on National Guard and Reserve service. Applied values military veterans as they have a unique ability to combine technical expertise with a passion to solve our customer problems. We recruit "military alumni" who are smart, innovative, responsible, team players and team builders, all common traits for those who have worn our country's uniform. On this Veterans Day, on behalf of Applied Materials, we thank all military veterans and their families for their service to their country. For more information about Applied's military program visit our web site. 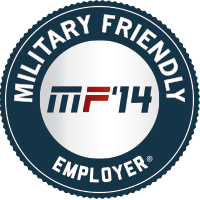 Now in its 11th year, the Top 100 Military Friendly Employers® list is the premier resource for transitioning service members and spouses seeking civilian employment. The survey results that determined the 2013 list were independently tested by Ernst & Young LLP based upon the weightings and methodology established by G.I. Jobs.